Connect this Orico hub to a type-C port and create (extra) USB3.0 type-A ports. This allows you to connect more peripherals such as a smartphone, tablet, keyboard or printer. Does your laptop, desktop or latest MacBook have little or no type-A ports and would you like to expand this number? Then this black USB3.0 hub with type-C connection from Orico is the product you need. By connecting this hub to a type-C connection of your laptop, you immediately create four (extra) type-A ports. You can now connect more peripherals such as a mouse, keyboard, printer or hard disk. USB type-C is the latest connection, which will eventually replace the traditional USB3.0 type-A connector. Several new laptops and computers including the latest MacBooks already have the USB type-C connection. The design is slimmer, because various connections are omitted. This includes the type-A connection, which you can perfectly create with this matt black hub from Orico. Thanks to the USB3.0 technology, the modern type-C hub with four USB3.0 type-A ports can achieve transfer rates of up to 5Gbps. This is no less than ten times faster than the transfer speed with USB2.0. 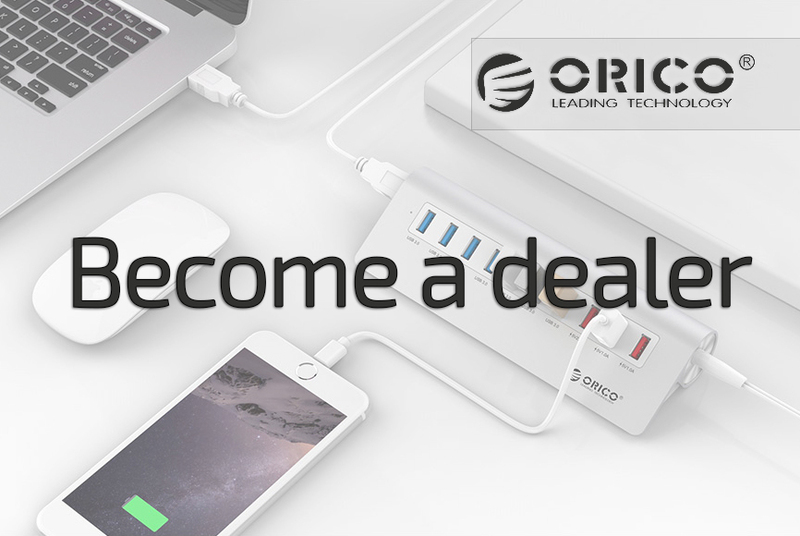 The Orico USB3.0 type-C hub with four type-A ports is equipped with a mini-processor. This is also called a VIA controller or VIA chip. The chip ensures that the ports do not become overloaded during use. Partly because of this the hub will function optimally and achieve high transfer speeds. Do you like to bring your laptop or use a computer at school or at the office with a type-C connection? Then it is also possible to take the hub with you wherever you want to use the four (extra) USB3.0 type-A ports. You can easily carry the matt black Orico hub in your pocket, bag or suitcase due to its compact size and light weight. The matte and satin black finish gives the product a luxurious and modern look. The product fits well in an 'Apple' environment, but also good with another laptop or desktop with type-C connection. When used, the LED indicator of the stylish hub lights up. The black USB3.0 hub from Orico is compatible with Windows XP / 7/8 / 8.1 / 10 / Vista and Mac OS. No driver is required. You can connect many peripherals to the hub, including a smartphone, tablet, hard disk, USB stick, keyboard, mouse, adapters and other 5V devices. The hub with four type-A ports is well secured. This is due to the multi-safety security system, which will prevent leakage current, short circuit, overheating and overvoltage. So you can safely connect multiple devices to the hub at the same time. ✔ Input: 1x type-C USB3.0. ✔ Compatible with: Windows XP / 7/8/10, Windows Vista and Mac OS. ✔ Compliant: RE / FCC / RoHS. ✔ Product dimensions: 106mm x 32mm x 25mm.